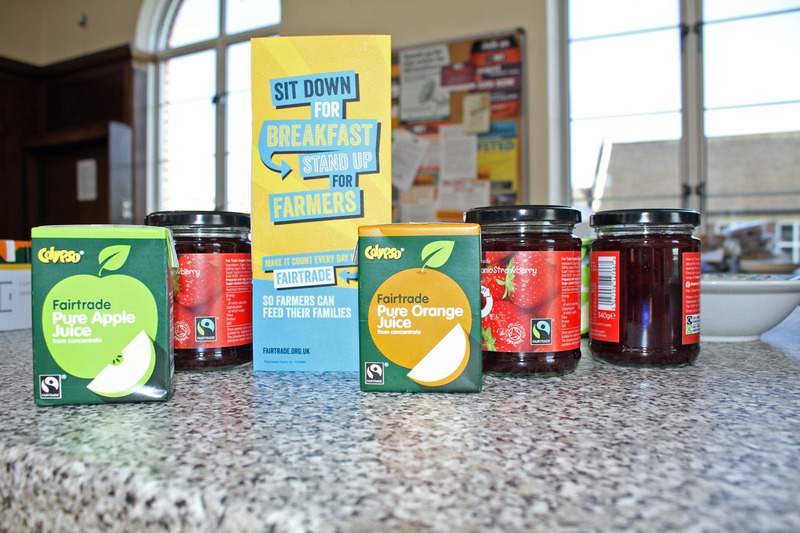 Thousands of schools across the UK got involved with Fairtrade Fortnight – holding Fairtrade Breakfasts, composing songs, baking, learning, meeting Fairtrade farmers, organising conferences and even putting together an interpretative dance routine to celebrate Fairtrade. It’s been fantastic hearing about all the brilliant ideas, learning and fun happening all around the UK. A huge thank you to all the schools that wrote to tell us what you’ve been doing, and shared their stories and photos via @FairtradeUKEd. The Fairtrade Breakfast was a really popular activity. Oaklands Catholic School in Hampshire hosted a Fairtrade Breakfast and invited parents in to share the food, and the school received a visit from Julio, a banana farmer from Colombia. He spoke to everyone in school, and students from a local primary school were also invited. Their teacher Ms Haragan told us, “It was wonderful to hear his story and how Fairtrade has made an impact in his life.” Julio also visited the Salesian School in Surrey, where students had raised £200 for the Fairtrade Foundation through Fairtrade bake sales. St Philip Howard Catholic High School in West Sussex held a recipe competition, and have had the idea of putting together a breakfast recipe book with Fairtrade ingredients, while at Cefn Glas Infant School in South Wales, everyone wore green and blue to school and enjoyed a Fairtrade Breakfast; toast and porridge with different Fairtrade toppings like jam, honey, sugar and bananas. Parents came to a coffee morning with Fairtrade drinks, biscuits and cake. Pupils at Canilfan Addysg y Bont on Anglesey celebrated by holding an assembly for the school, and inviting lots of people on Anglesey! Their teacher Miss Fretwell told us, “We invited Rhun ap Iorwerth, a Welsh politician who represents Anglesey in the Welsh Assembly, the local minister and some of the school governors and the local Fairtrade representative. A local primary school also joined us.” Students at Lurgan Junior High School in Northern Ireland boarded an Education Bus for workshops focusing on Fairtrade! 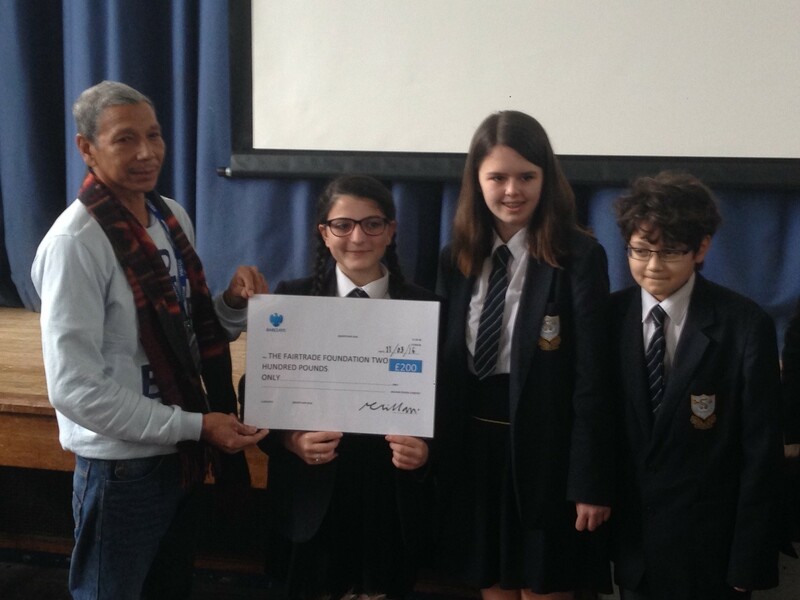 Hillpark Secondary School in Glasgow held a breakfast event with Fairtrade fruit, muffins and smoothies, and put together a Fairtrade Day of Action with “Fairtrade Chocolate Fountain, Human Vending Machine, stalls and fundraisers using Fairtrade goods. We will also have a hip hop theme with rappers and our dance crew performing”, said their teacher Ms McRae. 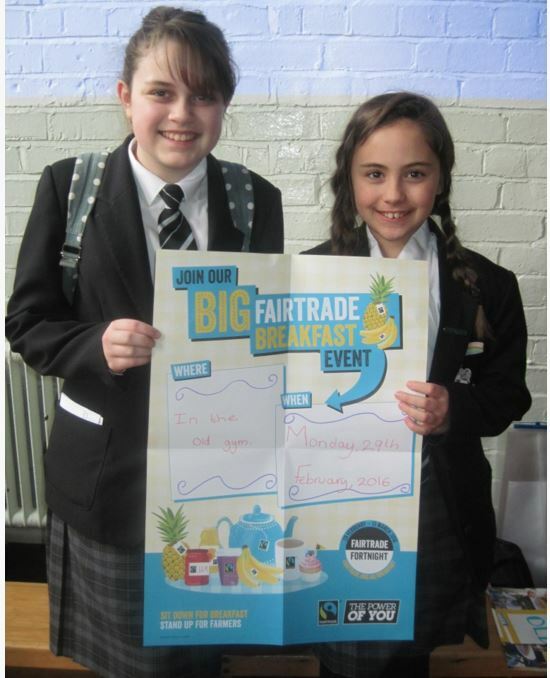 The school also raised £2500 holding stalls selling Fairtrade goods. 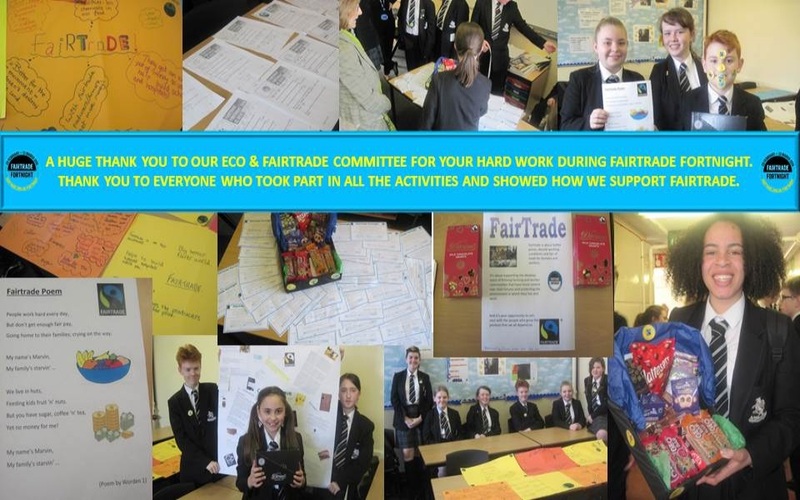 Everyone at Balshaw’s Church of England High School in Lancashire got involved with Fairtrade Fortnight, from a whole school assembly with Fairtrade chocolate samples to competitions and a pop up swap shop, where students got Fairtrade hot chocolate in return for a tweet about Fairtrade. 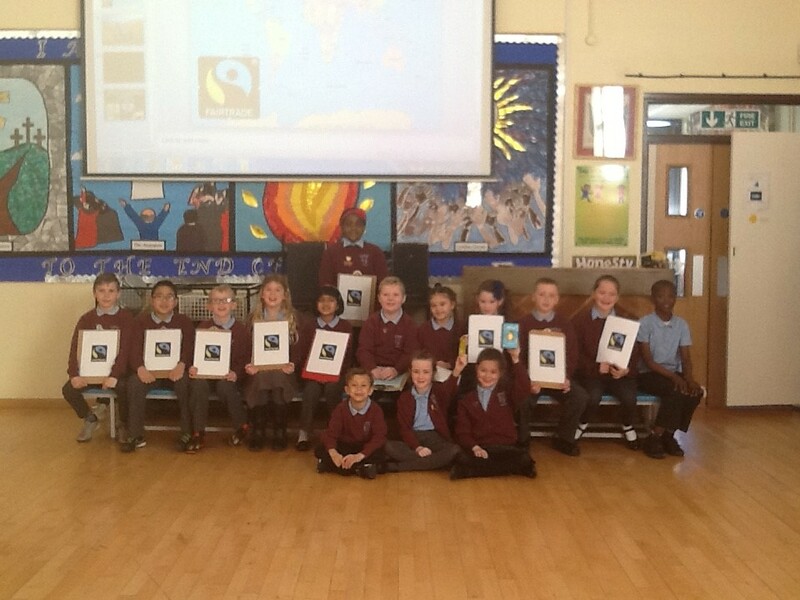 “Our catering team Chartwells are supporting by selling Fairtrade hot chocolate and cookies”, their teacher told us. Mrs Lalli at St Paul’s CE Primary in the West Midlands wrote to tell us about the fantastic learning in every class, through a focus on Fairtrade. While reception did collages, year 3 “wrote letters to the local Morissons persuading them to stock more Fairtrade goods”, and year 6 focused on water sustainability in geography. The Fairtrade Group at Lenzie Academy in East Dunbartonshire went all out with a whole host of events for everyone in school, including lessons in several subjects, a bakesale, a staff breakfast, and teacher versus pupils benchnall game to raise money to buy the school Fairtrade footballs. “We are hoping this will all count towards our FairActive award once completed”, said their teacher. We’re sure it will – good luck Lenzie Academy!